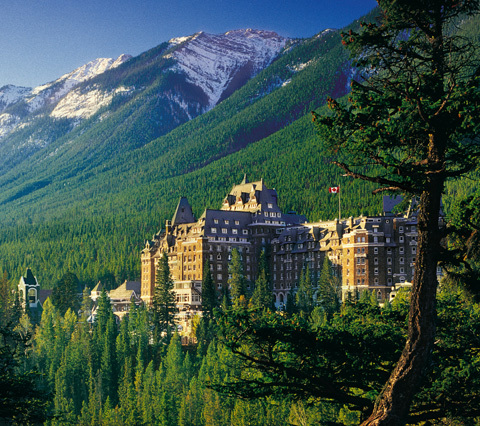 A trip to Alberta would not be complete without going to Banff and the Rockies. Driving through the foothills with my cousin Rina and her husband, I learned for the first time that Banff was in fact where both the maternal and paternal sides of my family connected. My maternal grandmother and great aunt both lived and worked in the 1960s in Banff, which was also where my cousin Rina was born. Our paternal grandfather was the Post Master of Banff in the 1950s, when the post office was in the Parks Canada building across the Bow River bridge on Banff Avenue. It's pointless to describe the beauty of Banff and the Rockies. Even my pictures don't do them justice. I highly recommend that you go and visit for yourself, especially if you love seeing animals run wild. The surprise this time around was visiting the now very upscale Canmore. Thirteen years ago, I drove through Canmore with my mother on our way to Lake Louise, and we stopped in at a roadside coffee shop. My mother told me that my cousin Rina might live in Canmore, as her father was from there. I got up to look in the phone book when my mother grabbed my arm. "Just a second. We'll ask her," said my mother, pointing to the waitress who was on her way over. "Mom," I said in protest. "This is embarrassing." "This is small town Alberta. She might know her." After the waitress took our order, my mother asked her the $100 question. "Well, there are quite a few with that surname in Canmore. In fact, there were a few in this morning. But I think I know who you are talking about," said the waitress. I looked at my mother in disbelief, while she nodded. "Does she have blue hair?" she asked. "She might very well," I said, thinking back to Rina's sense of style. "Yes, she moved to somewhere that starts with a C," said the waitress. "That might be it," she said. Years later, Rina told me that she did in fact have a blue streak in her hair and that she and her husband were then living in Carstairs. This time when we drove through Canmore, I didn't even recognize it. Million dollar homes lined the streets, as did high-end shops. I doubled over with laughter when Rina showed me a few remaining hold-outs from days of yore. A certain monsieur with lumber piled in the front yard and a 1970s Cadillac parked at an angle sans driveway. Rina's father came from a large family, and when she left Vancouver for Canmore, her mother gave her a little advice. "If you date anyone in Canmore, you better ask him if he was born there," said her mother. The comment was lost on my cousin until one weekend on a date, a certain young man started to talk about his uncle Frankie. "What a coincidence! I have an uncle Frankie too," said Rina, suddenly remembering her mother's advice. For a young woman new to town, this was not an easy situation. On the one hand, her paternal grandmother was Scottish and professed lineage to the royal family, but on the other, granny had a still for making gin in her bathtub. Tell me reader, what would you have done in a similar situation? Shrugged off the fact that you both had an uncle Frankie. Tried to determine if uncle Frankie was one and the same. Said good night to the charming young gentleman and run like hell. : Banff and a Canmore Family YarnTweet this! Ooh, I think I would have asked about Uncle Frankie. I'm really interested in learning more about this gin makin' granny too! Thanks for sharing it looks and sounds like an amazing place. I heard some great stories about granny. One week the offering was blackberry gin, which my cousin courageously tasted. The bad news was, it was wretched. The good news, she didn't go blind. What I really want to know is what Rina did in that situation. Do tell! She made sure that they were talking about the same Frankie, she excused herself and then ran like hell. The Bixi: Success For All?